I love cricket. I’ve been playing and watching it for years. For me each new season generally starts when the latest cricket gear catalogues start appearing in the mail and online around September. For anywhere between a few hours to a few days I revert to my ten-year old self, pawing over the glossy pages, “ooh”-ing and “aah”-ing over the latest bats pads and gloves. 90% of cricket bats worldwide are mass machine produced – these are the ones you will see in these catalogues and big chain sports stores and come in enough sizes, shapes and weights to suit pretty much everyone. I’m 6’8” tall. Regular-sized bats tend to look like matchsticks in my hands and taking up a stance at the crease requires me to almost bend in half to touch the ground with the toe of a normal sized bat. I’ve played like this for many years, but last season I decided to do something about it – I got my own personalised, “Andrew-sized” bat made! In Hawke’s Bay we are very fortunate to have two highly regarded, highly skilled hand crafted cricket bat makers based in the region. 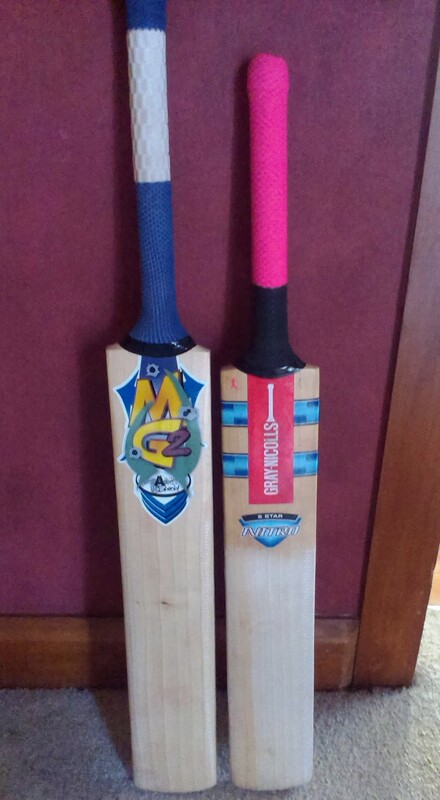 I have known one of those bat makers, Marty Graham – owner of MG2 Cricket, for years. He’s been a fantastic supporter of my cricket club, Napier Old Boys Marist and now plays for us too. Marty has made bats for some of the biggest stars in cricket, so when I asked him to make an XL-sized bat bat for me (one of the biggest stars in my own lunchtime), he happily obliged. It was quite a fascinating process. Marty keeps you updated on your bat, checking to see if you prefer it this way or that way. Oval handle, or round? Big, thick edges to smash the ball around the park? Or a thinner, more precise bat for a longer, tactical innings? Stage One begins with a raw “Cleft” – literally a solid block of willow that Marty sources from overseas. While we have willow trees in New Zealand, they’re not the right type of willow for bat-making. Marty checks the cleft and selects which end will be best as the top “Shoulder” of the bat and which will be the bottom “Toe”. Then he starts planning the edges of the block, thicknesses the cleft down to bat width and planes the front “Face” of the bat. The bat is pressed to make it harder, the “Splice” is cut in the top where the handle will go and the bat’s “Shoulders” are formed. My bat – Somewhere between Stages One and Two. Stage Two involves the bat’s handle being fitted and the bat being cut to length and size. 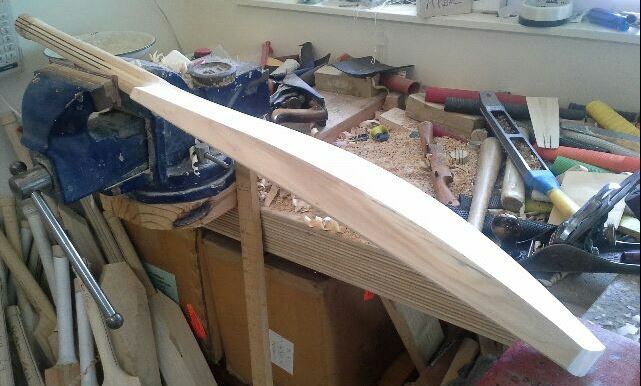 By Stage Four we are into the final stages as the bat is sanded and shaped into its final style / design. Oooh, Pretty! My bat in its final stages of creation. Stage Five is finishing – the bat is polished, the handle is bound with string and the handle’s rubber grip is put on. Labels are applied and the bat is oiled with linseed. 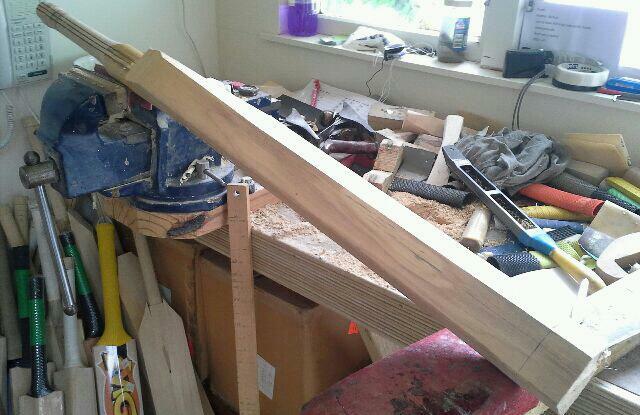 A hand-crafted bat can be made in as little as three hours – this is without glue drying time etc. factored in. A further hour is usually added for “Knocking In” – preparing the bat for a lifetime of hitting hard, leather cricket balls by, well, repeatedly hitting it with hard leather cricket balls (or mallet) and oiling it with linseed oil. So, regardless of size or grade, it can take as little as four hours to make a bat! Hand-crafted cricket bats are generally not made one at a time. Usually a bat maker would have several bats in various stages to make the best and most efficient use of time and materials. Marty says it’s generally best to be working on anything from 10 – 15 bats at any one time! 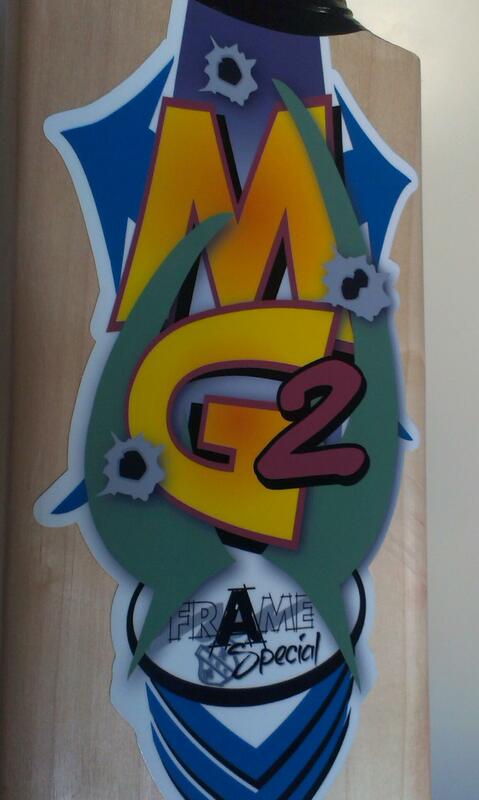 Despite their old-fashioned bat making mehods, most of MG2’s custom is sourced from a very modern method – the internet. As well as operating a website where you can order bats, gloves, pads etc. MG2 also has a popular Facebook page attracting lots of customers, fans, ‘Likes” and pics of Marty’s products in action. We’re very fortunate to have someone as highly regarded and skilled in the cricketing world as Marty is in Hawke’s Bay. So if you are intending to play cricket this season, please check him out! 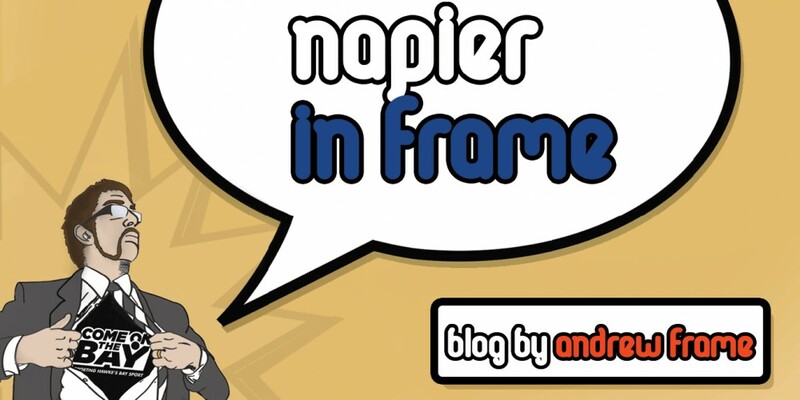 This entry was posted in Hawke's Bay, Sport, Writing and tagged Hawke's Bay, Napier, Retail by Andrew Frame. Bookmark the permalink.